Rob emailed me with this drill for [tag]basketball inbound plays[/tag]. Here’s what he sent. Give it a try with your team and let me know how it works for you. 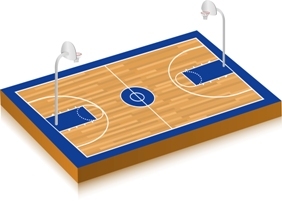 Here is an [tag]inbound[/tag]s [tag]basketball[/tag] play underneath your basket that will beat a zone every time. Stack or line up in front of the inbounder. First player in line is the best [tag]shooter[/tag]. Last player in line is preferably a post player who can make a six foot bank shot. On start of play, the first player in line goes to the ballside corner getting ready to catch and [tag]shoot[/tag] for a three pointer. The second player in line screens the *middle* player in the zone. The third player in line turns and screens the closest player near the ballside elbow area who can intercept a [tag]pass[/tag] to the last player in line who is coming straight down the line towards the ball. If you can imagine this against a 2-3 zone for example, you don’t screen the [tag]defender[/tag] on the ballside block, closest to the ball. You pick on that defender and take what they give you. If that defender runs out to cover the shooter, then the post player coming down the line is open. If the defender stays home to take away the post player, the shooter is open in the corner. Just read the defender and react!